" In a few years I would own a piece of a company who's book value had increased at 15% or so for the holding period. 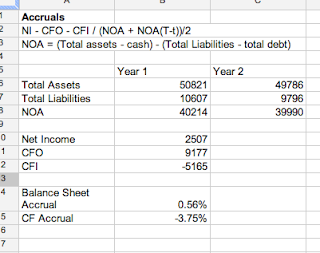 The problem I realized is that while the company has a really nice ROE and ROIC the invested capital is mostly debt, leases and intangibles. The problem is even if I held for 5 years and ROE averaged 15% for those five years as an investor I wouldn't have anything tangible that increased. " I'm not very good at looking forwards but doesn't this depend on free cash flow? IF FCFROE averaged 15% for five years the company would presumably end up with a very tangible pile of cash it could return to investors or splurge on an acquisition. The problem with any projection like that is, as you say, the company changed radically in 2009 so it's difficult to say how typical 2011's performance might be. Correct, I guess the real issue that I should have shown is that while FCF appears high after taking CFO-Capex that cash seems to disappear. For the most recent year they paid out a dividend, repaid some loans, extended a loan to management, and saved a bit of the cash. So while the raw FCF number appears high not much of that FCF is hitting the books. Great comment though this post really reinforces with me the idea that examining the cash generation and uses of cash is really important. How significant is the loan to management? I guess that's the uneasy bit as the other things you mention are legitimate uses for cash. Although there it was low cash flows from operations and capital expenditure that did the damage. I couldn't ignore it (though it might be acceptable in a fast growing company that is investing heavily and expanding its working capital). 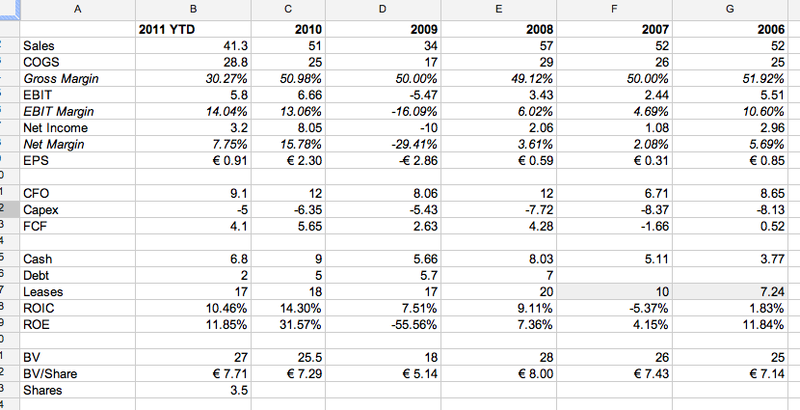 In the last quarter the company had €2.9m in FCF of which €1m went out as a loan to management so about 1/3. The rest of the free cash went to pay interest and repay bank debt. Great post on Smith & Nephew, I really like the shareholder wealth graph, I might have to borrow the idea. The summary you have at the end of the post summarizes what killed Basler as well, leases and questionable FCF use. One thing I'd like to know that isn't disclosed is if the building the company leases is owned by a related party. It wouldn't be surprising if Basler himself owns the facility and is leasing it to the company. 1) The things you use to describe Basler as a hidden champion are mostly qualitative. If I look at a quantitative measure of "amount of champion", namely ROE, Basler doesn't look like a champion at all to me. To be classified as a champion I would need to see a high and stable ROE, e.g. 20%+ over a period of 10 years. You said that they have sold off a loss making division, is your opinion that this was such a big event for the company that it turned Basler into a possible future champion? Any light you could shed on this would be much appreciated. 2) The technology you cite doesn't seem very sophisticated to me actually... A GoPro Hero 2 (http://gopro.com/cameras/hd-hero2-outdoor-edition/) can be bought for around $300,- and has a lot better specs and is equally small (It only lacks the gigabit ethernet connection, but I'm not exactly seeing the point of that, since video bitrate is probably much, much lower than gigabit/s (BluRay=40Mbit/s) so instant transfer is possible at much lower transfer rates anyway). This brings me to my second point: the moat. It doesn't look very strong me. I can't really spot any customer lock-in (e.g. high switching costs, extensive training needed upon change, etc. ), the technology doesn't seem proprietary and there isn't a lot of capital needed to enter the business thus competitors can easily jump into Basler's niche. What's you opinion on this? Great questions, I actually had some similar comments on my last hidden champion post. I think there is a bit of a misunderstanding from readers about what exactly constitutes a hidden champion. I at first had the same thought as you, a company that has some sort of near monopoly and stats to back it up, a 20% ROE would seem appropriate. I think the problem is not many, or any hidden champions or companies in general can sustain growth like that for long, eventually they'd be as large as Exxon Mobile. A hidden champion is usually a company that does have a very large or near monopoly position in it's specific niche. Within that niche they are known as an industry leader for quality and execution. The reason they're called hidden is that usually only their customers or companies in their line of business know about them. So some hidden champions might be companies that make industrial stamping equipment, unless you're in the industry you'd never know who makes the best machines etc. So given all of this I think it's easier to look at Basler. Yes they don't have an ROE of 20% sustained it's probably closer to a market ROE, but they do have the largest market share in a very fragmented industry. I don't think I really clarified in my post, but I'm not sure it's just the camera technology. You linked to a great little camera, it looks like a skiing helmet cam. The issue is if a company like Coke wanted to buy a system that used cameras to detect floaters in their coke on the assembly line they would have to buy these cameras individually, and then write software to handle all of that. Basler has an integrated system, so Coke would call them and they could deliver the entire thing. I think what makes Basler a hidden champion and not just another camera manufacturer is their expertise within their space. They have these specialized systems for industrial, medical and traffic use that no competitor can touch. Additionally they've honed their expertise over the last 20 years. So when a municipality needs a traffic camera system Basler is most likely who they'd purchase from. Or Basler components are so widely used that no matter what vendor they purchase from the cameras and software all come from Basler. I think all this leads to the moat question, I try to think of moats like this. If I was given unlimited money could I dethrone a specific company. As an example consider MasterCard or Visa even if I had unlimited resources it would be near impossible to get most every merchant worldwide to adopt my new system, and get consumers to use it, that's a moat. I think Basler is similar, they have the expertise and knowledge in this field that no other company has. So even if you wanted to create a competitor you'd have to hire away all of Basler's engineers to do it. Hopefully this answers both question, let me know if it doesn't and I can try to clarify. I'd highly recommend the hidden champions book by Hermann Simon he goes into a lot of this stuff. First, more as a side note, a company can sustain a high ROE for very long, without becoming the size of Exxon by distributing a large part of earnings to shareholders (instead of investing in the company and compound it). I'm still not convinced Basler is a hidden champion. Being a leader for 20 years and still having a loss making division? Also the barriers to entry still seem very small to me. GoPro for example already has the possibility to manage 50 cameras at once via WiFi. If they step up their game, hire a couple of software engineers (which are abundant these days) you got your software and the total package, which could potentially compete with Basler. Also the trouble of switching to another supplier seems pretty easy to me. For CocaCola the camera system is just a seperate thing, it operates on its own, has its own software, etc. so replacing it with a similar product from a different company is pretty easy (it's not like it's running the same software as all the other systems at Coke). It comes down to this I think: I feel Basler is like MySpace and a Facebook can come along very easily. Even if they were a champion, a very low ROE and a loss making division don't convince me they actually were a champion. They might be recognized as an industry leader, but apparantly they didn't have pricing power/customers weren't prepared to pay a premium for their products. Given my reasoning above, I actually think Basler is much different from MasterCard or Visa. Btw, I haven't read their annual reports, so I might just be ill informed, but this is my take-away based on your write-up. I think this discussion is extremely fruitful, as it shows that identifying a moat can be very difficult. I'm wondering what Buffett would think of Basler (him being the ultimate 'moat spotter' ;)). You're right about the ROE, although most companies don't distribute enough of their earnings which is a shame. 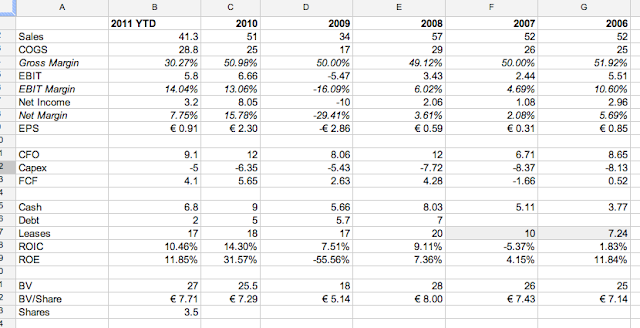 About the loss division, I don't think the division actually was losing money for years, it just had a higher cost structure and probably lower ROE. So when volume dried up in 09 the higher costs killed them. You have some great points about Basler. Your point about GoPro sort of reinforces Basler's advantage. The market is fragmented, lots of small companies, but what would make Coke switch from a Basler system to a GoPro system? Especially if GoPro didn't have the experience behind it to show that the kinks had been worked out. A lot of larger companies will pay up for experience and to ensure that a system works without a flaw. My brother works for an industrial company who is a quality leader in their market. They get a LOT of business from clients who passed on them for cost and then a few years later have a broken system. The company would prefer to sell the integrated solution from the start, but they're happy for the call. Even if Basler is a hidden champion which according to the expert Hermann Simon it is I don't see it as vital to a clients systems as some of the other products hidden champions make, I think this is the major rub. The other champion one I own Corticeira Amorim basically owns the cork market, and you can't sell wine without a cork. You can use synthetic (their biggest threat) but there are problems with synthetic, and no high end wine buyer is going to want a fake cork. To me this is a big advantage, they own the market and the product can't be sold without them. Basler isn't in the same position, it seems that while their products are useful they aren't critical. So the hidden champions are those companies which are usually market leaders in a niche technology.